The long-running Confessions of a ­Customer™ is one of columnist Eric ­Anderson’s commitments to the industry, which includes his retail sales training ­efforts and service to the MIC Board of ­Directors. He has built several well-known aftermarket brands and is the founder of Vroom ­Network, an ­­industry-specific ­consulting company specializing in ­marketing, training and brand ­development. Virtual Reality Is Coming… And Your Dealership Is Going! The Good, the Bad and the Downright Ugly! Retail Ruckus: Big Boxes Stores Bite the Dust! The date, April 1, 1968; and the place, Liberty, Missouri. There were no fools around on this particular day, only the brilliance and passion of Bill and Janey Heishman as they opened the doors of Liberty Cycle Center for the first time. Bill was an avid motorcyclist and successful racer, with most of his throttle twisting behind the bars of a Norton or BSA. Neither he nor his wife were strangers to the motorcycle world, and recognizing the growing popularity of the sport, they put together a business plan. But this plan was like no other. Sure, there had to be something to sell and services to offer, but their new business was going to focus on customers and community. They both knew that this was the key to success, and caring about the customer was the most important thing. They coined the slogan “The Dealer Who Cares,” and the business began to operate under that slogan from day one. Did it work? You bet. Starting in a modest 400 square foot facility with Norton as the only nameplate, the days were spent selling motorcycles and parts, and the evenings and nights, no matter how long it took, performing service and repairs. The couple quickly brought on Moto-Guzzi and Ducati and in 1969, Suzuki motorcycles were added to the lineup. By 1972, they had a new location and a new 10,000 square foot building to match. Liberty Cycle Center now had the room to offer its customers the ultimate in motorcycles and accessories. Firmly established and with a full head of steam, they purchased Liberty Kawasaki in 1991. By then, ATVs had a firm grip on their place in the market, and a 6,000 square foot addition was added to handle the new products and the expanding industry. In 2001, they added Yamaha to the mix, and as they rolled on into the 21st century, they continued to grow and evolve into much more than just a motorcycle dealer. In 2012, they transformed their name into LCC Powersports to more accurately represent the products they carried and the industry they served. Still building on their momentum of success in 2015, they added KTM to their already impressive selection. Over the years, ownership of the dealership transitioned to Jeff Heishman (the couple’s son), who is the current president. Heishman has been dedicated to uphold the values and customer focus that have always been a part of LCC Powersports. Sadly, in 1996 his mother passed away, and in 1997, Heishman started the Janey Heishman Ride in her memory as a benefit for the American Lung Association. Twenty-one years later, Janey’s Ride is still an annual event and it has raised hundreds of thousands of dollars for multiple charities. Heishman also worked on a committee that planned, organized and ran the March of Dimes Bikers for Babies ride in Kansas City for almost 20 years. In addition, LCC Powersports hosts and promotes regular Liberty Touring and Riding Association meetings. The LTRA is a family oriented road-riding club to promote motorcycling as a recreation and sport. There are no dues and no mandatory meetings; it is all just for fun. LCC Powersports also sponsors the local MSF rider-training course by loaning them motorcycles each year. Heishman grew up in the dealership, riding his first motorcycle at two years of age and eventually racing quads professionally, so it should come as no surprise to hear that he is also a sponsor of about 30 different racers and multiple different racing series. On the product side, there is something for every type of rider at LCC Powersports, but when it comes down to it, Heishman said that about 65-70 percent of their business is generated by the dirt bike segment. ATV sales are also strong, and they do a lot of business with farmers and ranchers. They have been a Fox dealer since 1974, with Fox, Fly and Shoei being among some of the more popular brands of apparel and gear. “Adventure riding has not caught on strong in the area,” Heishman said. He gradually shifted his personal interests more into street riding and currently rides a KTM 1190 Adventure. “It’s a super comfortable bike,” Heishman said. By riding adventure, Heishman hopes he will be able to boost adventure riding and get it going on a larger scale. With the changing forms of media and technology, LCC Powersports has seen a shift in their business model, too. “The internet has created a lot more competition,” Heishman said without concern. 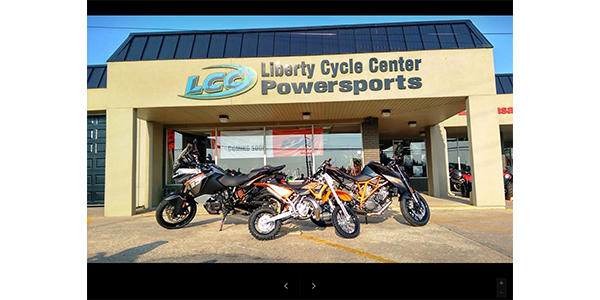 To capitalize on the internet, LCC Powersports has a well designed, easy to navigate website that helps their customers with an easy online experience. When it comes to social media, Heishman takes full advantage of it. “Social media has been one of the best advertisement tools we’ve had,” Heishman said, and he personally responds to each and every review and question they receive. You might guess that employee morale is high at the dealership. All of LCC Powersports’ employees are constantly engaged as a team and with their customers, which builds on the original values that have been core to the business since it opened its doors. “The most important thing is and has always been caring about the customers,” Heishman said. All of the staff is aware that this is the M.O. of LCC Powersports and they know this is what sets them apart and creates a caring and fun working environment. To demonstrate their customer commitment, LCC Powersports sends out a lot of letters. We’re not talking e-mail; we’re talking real, hand written, hand signed letters. Every morning at the dealership, the first order of business is to get together and send out birthday cards to customers and each one is hand signed by all of the employees. In addition to many great activities, events and promotions, LCC Powersports has a focus on modern, clean and organized showrooms filled with a top of the line selection of motorcycles, ATVs, apparel, gear and parts. The service department offers maintenance, repairs, warranty work and many additional services, all with the quality one would expect.